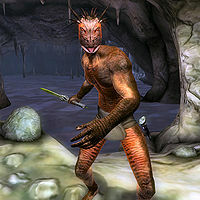 The Argonian Tribesmen are found in all four zones of Veyond Cave but nowhere else. There are five in the first zone, between three and five in Veyond Black Waters, six or seven in Veyond Sea of Darkness, and four or five in Veyond Great Sump. None of them have any spells and all types are naked. 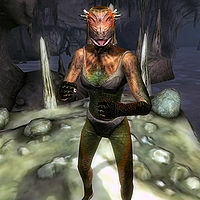 Along with the Argonian Shamans and Argonian Chieftains, the tribesmen make Veyond Cave a dangerous place to visit. 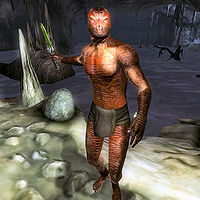 This type is armed with a leveled dagger, which may be enchanted after level 4. 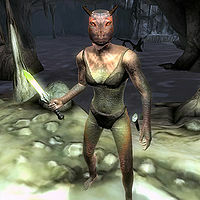 She may also have a leveled poison (25% chance) and up to three lockpicks. Ironically, given this type's class, it carries no weapon and fights hand-to-hand. 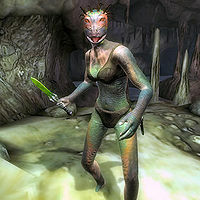 She may carry a leveled poison (25% chance) although without a weapon it can't be used, and up to three lockpicks. 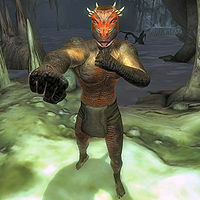 This type is also unarmed and may carry a leveled poison (25% chance) and up to three lockpicks. 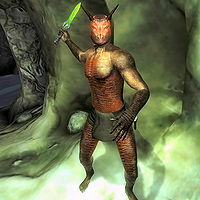 This type is armed with a leveled dagger, which may be enchanted after level 4. He may also have a leveled poison (25% chance) and up to three lockpicks. Ironically, given this type's class, it carries no weapon and fights hand-to-hand. 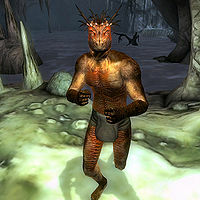 He may carry a leveled poison (25% chance) although without a weapon it can't be used, and up to three lockpicks. This page was last modified on 30 December 2014, at 06:06.